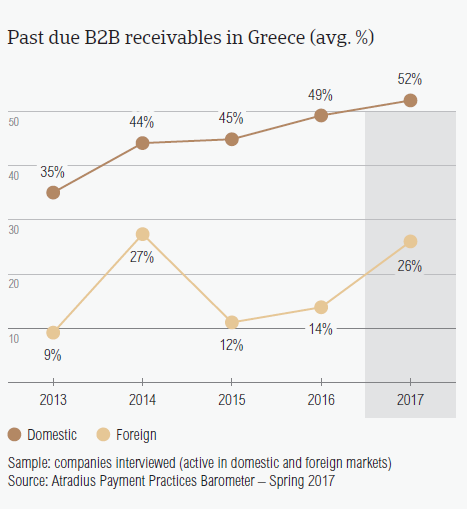 Compared to one year ago (31.5%), Greece has seen an increase of almost seven percentage points in the percentage of overdue B2B invoices in 2017 (38.6%). In 2017, the Greek economy is forecast to grow 1.5% and exports are expected to pick up. As a result of the modest economic rebound, insolvencies are expected to decline 2% reversing the upward trend since the 2008 crisis. In 2017, there has been a decrease in the percentage of the total value of B2B sales on credit in Greece. Still, Greece (52.1%) remains one of the countries in Western Europe with a very open stance towards this method of payment. 60.6% of the sales to B2B domestic customers was transacted on credit. This shows a decrease of four percentage points compared to last year. The percentage of B2B sales on credit to foreign customers also decreased this year (43.7%) from 48.3% last year. 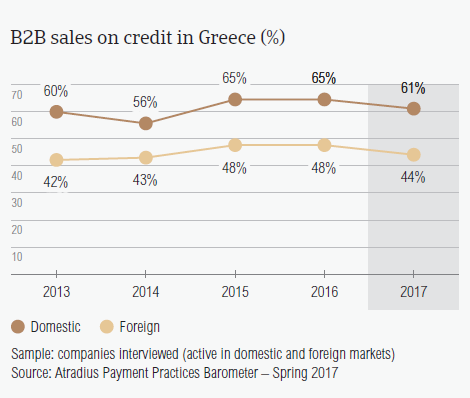 Compared to the regional averages (domestic: 42.6%; foreign: 35.1%), respondents in Greece are more likely to sell on credit terms to both domestic and foreign B2B customers. Together with Denmark (56.4%), Ireland (48.2%) and Sweden (47.8%), Greece is one of the most trade friendly countries in Western Europe. However, unlike in these countries, domestic B2B customers of respondents in Greece are far more likely to be offered credit terms than foreign B2B customers. Compared to one year ago (31.5%), Greece has seen an increase of almost seven percentage points in the percentage of overdue B2B invoices. However, the payment default rate recorded in the country (38.6%) is below the average for Western Europe (40.6%). 66.4% of respondents in Greece reported having experienced late payments from their B2B customers over the past year. Respondents in the other Western European countries surveyed, reported late payment more frequently (87.8%). Greek respondents reported fewer late payments from their domestic B2B customers in 2017 (85%) than in 2016 (94.8%). In contrast, late payments from foreign B2B customers were reported more frequently (2017: 47.8%; 2016: 31.0%). The Days Sales Outstanding (DSO) figure in Greece increased from 53 days in 2016 to 60 days this year. In 2017, the difference between the country’s DSO and the regional average DSO (44 days) is two weeks. Looking ahead, most Greek respondents (60%) do not expect a change in their annual DSO. If a change foreseen, more respondents expect a slight deterioration (17.2%) than a change for the better (13.2%). 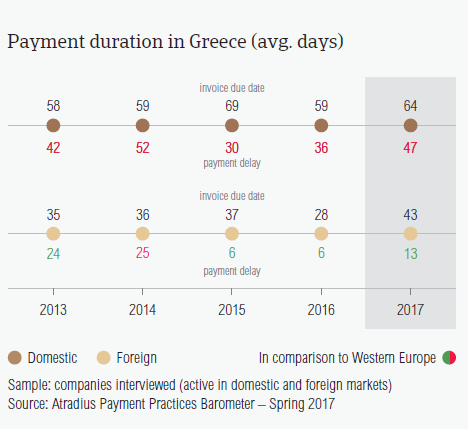 In 2017, domestic and foreign B2B customers of respondents in Greece enjoyed some of the most relaxed payment terms in Western Europe. Domestic B2B customers of respondents in Greece were asked to settle their invoices, on average, within 64 days after the invoice date. On average domestic buyers in Greece have a full month longer than domestic buyers in other countries to fulfil their payment obligations. Foreign B2B customers of respondents in Greece were asked to settle their invoices within 43 days, on average. This is also one of the most lenient payment terms extended in Western Europe to foreign B2B customers. Despite the longest average payment terms granted, the country’s average domestic payment delay increased from 36 days to 47 days. Foreign B2B customers of respondents in Greece also payed slower. Greek respondents received payments, on average, one week later than last year (2016: 6 days; 2017: 13 days). This means it currently takes Greek respondents around three months from invoicing to turn overdue B2B invoices into cash. The percentage of Greek respondents (75.0%) who stated liquidity concerns as the main reason for late payments by domestic B2B customers is the second highest in Western Europe after that of Italy (77.6%). Similar to what was observed in previous surveys, the main reason for payment delays reported by respondents in Greece remains insufficient availability of funds (domestic: 75%; foreign: 43.3%). The percentages have however declined since last year (domestic: 87.0%; foreign: 51.2%). Over the past 12 months, overdue invoices caused 26.1% of respondents in Greece to lose revenue. This percentage is significantly higher than in all of the other Western European countries surveyed. 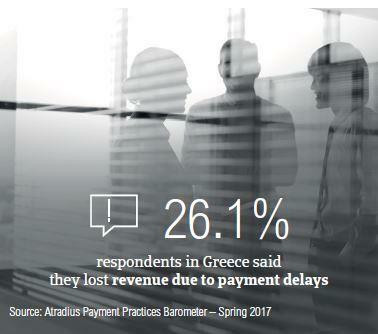 Late payments caused, 20.3% of respondents in Greece to postpone payments to their own suppliers while 19.7% stated they needed to take specific measures to correct cash flow. Among the Western European countries surveyed, respondents in Greece seem to be the least inclined to increase their use of credit management tools even with developments like Brexit, the slowdown in Asia and US protectionism. 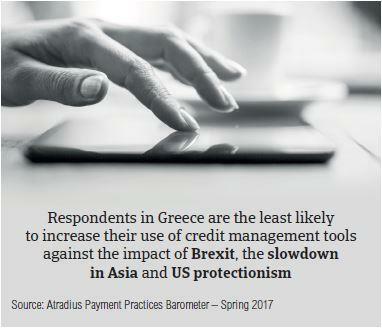 Despite the increase in payment delays and the uncertain impact of developments such as Brexit, the slowdown in Asia and US protectionism, the majority of respondents in Greece (52.4%) stated they will maintain their current mix of credit management tools. This compares to 48.3% who stated this intention in Western Europe overall. At the same time, only 6.5% of Greek respondents said they will increase protection against the above-mentioned developments. This is the lowest percentage of respondents who stated this and almost three times below the Western European average of 18%. Checks on buyers’ creditworthiness and monitoring buyers’ credit risk remain the most likely actions to be taken to improve credit management. However, the percentages of Greek respondents stating these (creditworthiness checks: 10.4%; credit risk monitoring: 9.9%) is almost half of that in Western Europe overall. US protectionism seems to be the most likely of all three developments to prompt Greek respondents to take action and increase their use of credit management tools. Despite a significant decrease from 2016 to 2017, Greece still has the highest percentage of the total value of B2B receivables written off as uncollectable (1.2%) of the Western European countries surveyed and twice the regional average (0.6%). Similar to what was observed in previous surveys, uncollectable receivables in Greece consisted almost entirely of domestic write offs (domestic: 2.4%; foreign: 0.1%). In 2017, the largest proportion of uncollectables came from the consumer durables, services, chemicals and food sectors. 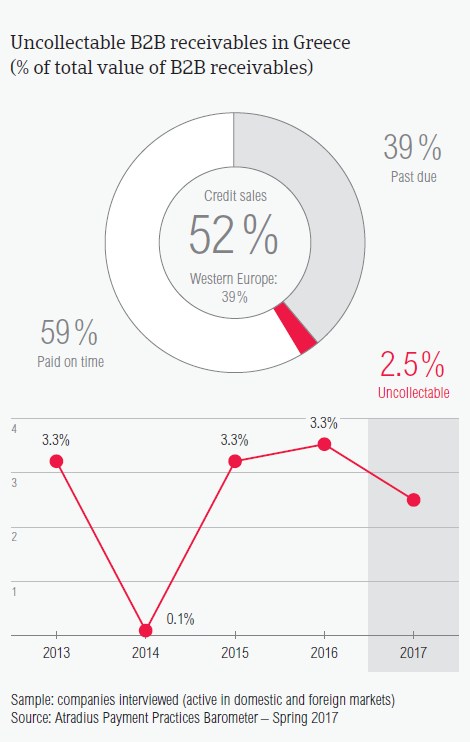 The main reasons why B2B receivables were uncollectable were the customers’ bankruptcy (61%), the old age of the debt (40.6%) and failure of collection attempts (39.8%). Similar to expectations expressed by respondents in Western Europe (26%), Greek respondents (46%) also expect an overall deterioration in the payment behaviour of their B2B customers over the next 12 months. B2B customers of respondents in Greece in the consumer durables (60 days), chemicals (56 days) and construction (55 days) sectors enjoyed payment terms longer than the country average. In contrast, B2B customers originating from the financial services (30 days) and metals (38 days) industries were given shorter average terms to fulfil their payment obligations. 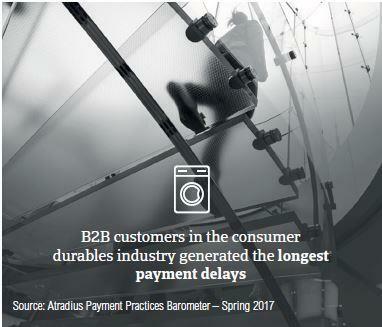 Despite being granted average payment terms of about two months after the invoice date, B2B customers in the consumer durables and the chemicals industries were the slowest with settling their payments (93 days, 68 days respectively). The main reasons behind the delay was insufficient availability of funds stated by 77% of respondents in the chemicals industry and by 76% in the consumer durables sector. Other key payment delay factors cited were inefficiencies of the banking system (consumer durables: 32%; chemicals: 23%) and buyers’ use of invoices as alternative financing (consumer durables: 28%; chemicals: 32%).